The imaging findings of soft tissue tumours are often non-specific and generally require biopsy to differentiate between benign and malignant lesions. The finding of curvilinear, annular or amorphous mineralisation in an enlarging mass has sinister connotations. 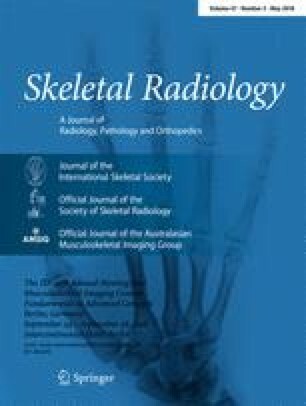 In this case report, we present the imaging findings with histological correlation of a chondroid lipoma, an unusual benign soft tissue tumour, which presented with radiographic evidence of calcification, an imaging finding not previously described. We also describe the ultrasound appearance and certain MR imaging appearances that have not been previously attributed to this tumour in the few reported cases.